Benjamins Steakhouse & Benjiman Prime: These local offerings from Peter Luger alumni put an extra focus on service and ambiance. Great for a meeting with clients, or a romantic night out. PJ Clarke s: Established in 1884, P.J. Clarke's is a saloon located on the corner of Third Avenue and 55th Street and has one of the best burgers in Manhattan. The Sea Fire Grill: American seafood and raw bar set in a swanky, spacious dining room with fireplace. The Grill: Steakhouse located in the iconic Seagram Building, steps from the hotel. Midcentury style compliments the extravagant and delicious dishes and cocktails served in this infamous space. Gin Parlour Cocktails: Enjoy classic and modern cocktails paying tribute to our history. Carefully created to showcase our thorough knowledge of wines and spirits, our offering is sure to impress all patrons. Gin Parlour Breakfast: Offering a wide range of options with international influences, our Gin Parlour breakfast is sure to leave you energized and ready for the day ahead. Bergdorf GoodmanThis should be your first stop for all high-end designer clothing, handbags and jewelry. Saks Fifth AvenueThis flagship location, open since 1902 houses some of the best known names in fashion. 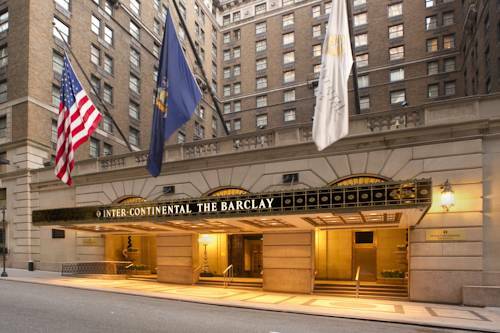 A destination within New York City, it should not be missed, especially during the holidays. Grand Central StationGrand Central walking distance. Penn Station is 15 minute taxi ride. Madison Square GardenKnow as "MSG" or The Garden to New Yorkers, this indoor arena is known by all for hosting a series of professional sports, concerts and other large-scale entretainment shows. Central ParkThe fist public landscaped park in all of the United States sits steps from The Barclay. A stroll through the park is a must for all who visit Manhattan. Empire State BuildingThe 102-story building stood as the world's tallest for 40 years until 1970, when the World Trade Center's North Tower in lower Manhattan was completed. Statue of LibertyLocated on Liberty Island in New York Harbor, the colossal sculpture sits proudly since 1886. 9/11 Ground Zero MemorialThe memorial and museum in downtown Manhattan commemorates and pays tribute to the lives lost on September 11, 2001. Radio City Music HallJust steps from the Barclay, Radio City Music Hall, also known as "the Showplace of the Nation," it also the headquarters for the Rockettes.